I have four apologies to make to you. First, I am sorry I missed your post when you first published it. Fortunately, Richard Whittall, Rob Carroll and Darrell Cobner alerted me to your story. When I last looked Richard’s tweet had received 918 likes and 255 retweets. Martin Bucheit’s tweet about your post has 19 likes. Your open sharing has touched many people. I am late to the party but am touched too. Profoundly so. I have been involved in the analysis of performance since the late 1970s. In the 1990s, I worked as a performance analyst in rugby union. For most of the decade, I had intense work periods that during competition and overseas tours extended to 18 hour days … week after week. It was an analogue video world. I was fortunate to have access to host broadcast videos and captured my own game video with the help of colleagues. We thought we had hit the jackpot with S-VHS format. I have a second apology to make. When I started the Centre for Notational Analysis in Cardiff in 1991, I hoped to create a career path for young people interested in performance analysis. We were at the start of a movement that has positioned you to feel the way you do. I am staggered by the creativity of people like yourself. The world you occupy is a quantum shift from the occupational culture of the 1990s. We do share the same vision though … to provide an invisible service to coaches that records, analyses and potentially transforms performance. My third apology is that despite my advocacy for performance analysis as a service, I have had limited success in persuading clubs and sporting organisations that our work should be valued rather than priced. Young people are still inducted into performance analysis as unpaid interns or lowly paid analysts. We are encouraged to believe that the status of being connected with a club or team ‘compensates’ for zero or low wages. Some learning organisations are pro-actice and make every effort to support their analysts financially and through continuing learning opportunities. Our dilemma is that we have so many people wanting to be analysts and often have the experiences you have. What is so important we have to share it? At the heart of this conversation is a profound debate about frequent augmented information. The availability of hardware and software has led to a surfeit of options for each analyst. What has changed in performance in training and competition? How might feedforward transform our practice? Now that you have shared your thoughts, I hope you realise that you have a world of friends who are just a phone call or email away. I hope too you will accept my apologies. Yesterday, I was re-reading Ben Alamar and Vijay Mehrotra’s 2011 discussion of the rapidly evolving world of sports analytics (Part 1). They have a reference to G R Lindsey’s 1959 paper proposing an operational analysis approach to baseball. By delightful serendipity, Simon Gleave was tweeting at the same time with news of Jurryt van de Vooren’s discovery of some 1937 association football data. 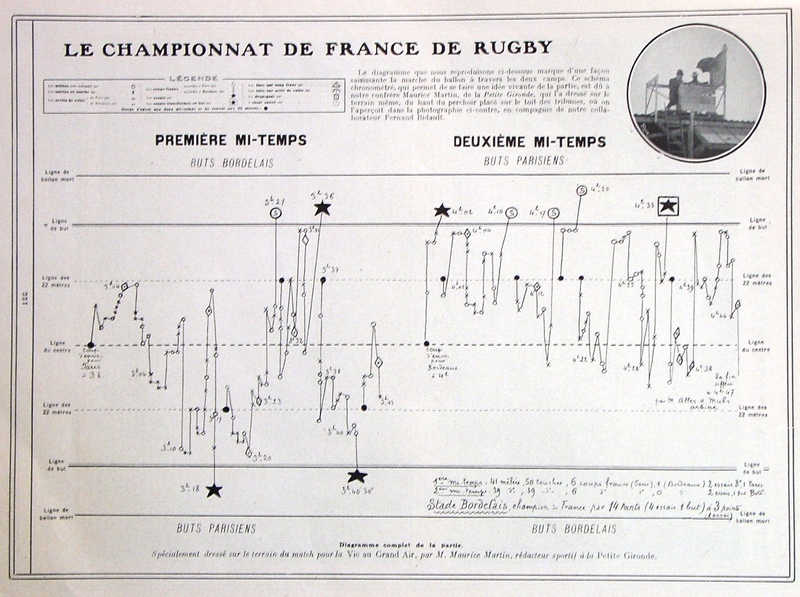 I do not have any earlier record of notating goal scoring in association football but Simon’s connection with Jurryt has added another piece in our jigsaw about the origins of performance analysis and sport analytics. We have a record of 47 shots (23 first half, 24 second half) from the game played between West Europe (28 shots) and Central Europe (19 shots). Another corner piece comes from 24 September 1898. This appears to be the oldest football clip in existence. The film is included in a Daily Mail article from 2014. The teams involved were Blackburn Rovers and West Bromwich Albion. I am hopeful that our crowdsourcing will produce even more genealogy connections. My earliest baseball discovery is from 1910 and Hugh Fullerton’s account of the inside game. … and 18 March 1950 (Charles Reep at Swindon Town v Bristol Rovers). Both pictures shared here are from Jurryt’s 17 December 2016 blog post Werden de eerste voetbalstatistieken al in 1937 gemaakt?